This High flow 50mm wastegate will control boost with dead on accuracy in the most demanding situations. The V50 is a favorite in the drag racing and road racing industries. 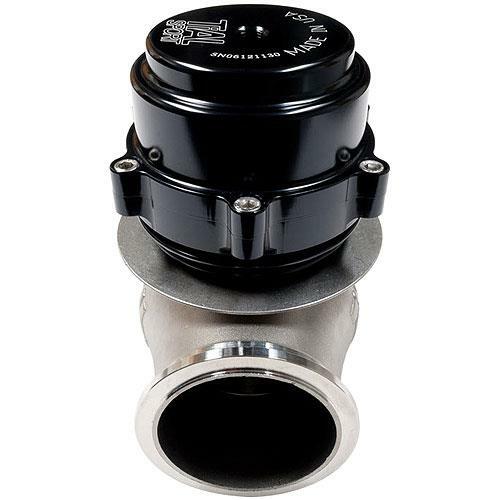 TiAL V50 50mm Wastegates are constructed from high temperature alloys for the valves and lower housings, CNC machined billet aluminum actuator housings and Nitronic 60 valve guides and seats. These high temperature materials were selected for their unique combination of high corrosion, wear and galling resistance properties. The billet aluminum actuator housing is lightweight and available anodized in silver, black, red, blue or purple. Inside is a 17-7 PH stainless steel actuator spring capable of consistent pressure at elevated temperatures. The TiAL V50 Wastegate spring base pressures range from 2.17 psi to 15.21 psi (0.149 to 1.048 bar). All TiAL wastegates are designed to optimize actuator-to-valve area ratio to provide maximum control and a wide dynamic flow capacity.